This is a “by-product” of my Doctoral thesis. I was having an interview with my artist friend WONG Wai Yin on the topic of motherhood in a café located in an alley in Hung Hom back in December 2013. 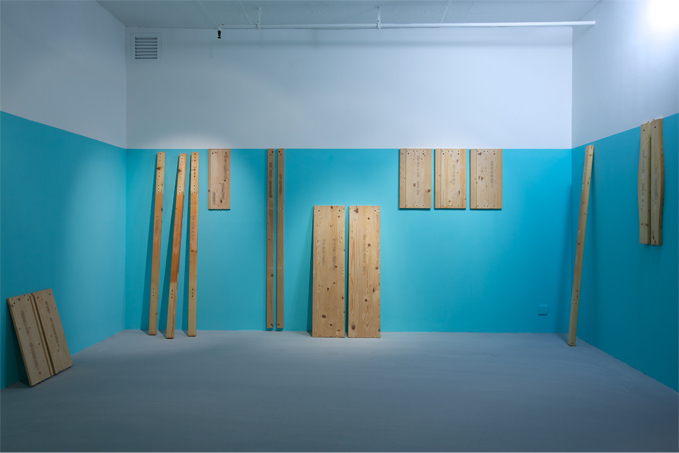 She mentioned a work on display in her solo exhibition during residence in New York – in which lines of various colours were gelled into lyrics from a song by Radiohead – “And you are now a star” on one side, and “and I’m still no one” on the other, with the “you” in the lyrics referring to her artist husband KWAN Sheung Chi (born 1980). He is her idol. She loves him dearly. On the hand as an art critic, I felt utterly sorry for her – why is she who always got wiped out by market force as he stays? That encounter explains my attempt in a seminar themed at Lee Kit. I led in the talk with names of female artists from the Faculty of Fine Art of The Chinese University of Hong Kong: TSANG Chui Mei (Born 1972), KWOK Ying (Born 1977), AU Hoi Lam (Born 1978), WONG Wai Yin (Born 1981), Sarah LAI (Born 1983) all the way to WONG Ka Ying (Born 1990), while deliberately skipping their male counterparts. With the indisputable fact that “Hong Kong art has been too good for too long. (quoted from Frank Vigneron) Hong Kong women artists are too good to be mentioned”, it doesn’t really matter if they like the categorization of “female artists”. I intend no categorization according to styles, but elaboration on their common problematique. Across generations during these somewhat 20 years, painting remains the axis of ideas among these female artists. It all starts with their positive or opposite relationship with painting– notwithstanding the media involved, and the nature of that “connection”. TSANG Chui Mei (graduated 1996) and KWOK Ying(graduated 2000) both picked painting as the sole medium. Tsang has been painting continuously for the past decade or so. Through the tactical application of colours, brushworks and layers, she delivered distinct sentiments while exploring on the constant subject, immersing herself in the space of the frame. Kwok on the other hand has been toying around the concepts of painting and objects, and deliberately confusing viewers’ sense of touch and vision. Daily objects “restored” in a plane were magnified and viewed in micro-detail: Works like tiles drew straight to the wall, plane-imitating door carpet, created a sense of unfamiliarity to viewers. Nonetheless, Kwok has recently shifted focus from practice to exhibition curation. AU Hoi Lam, TSANG Chui Mei’s roommate at Fontanian, is possibly a representative in the aspect of “painting as object”. She went even one step further by standing in front of her own work – expressing the biographical narrative through abstract shapes, colour planes, numbers and micro patterns. She might sometimes make use of the thickness of the painting to emphasize on the side of a work, just like creaming a sponge cake; at other times she might press the painting into a thin and smooth handkerchief. What stunned you most is probably the abstract format that seemingly deprives you of direct relation to the numerous stories to be told through the work. She might even refuse to give a word on what is actually going on after fetching you figures, time and venues, and confining you on a surface of rich texture – with repeated layering, treading and binding. After completing her Master degree in Fine Art, she even finished another thesis themed on Foucault. She rendered more in-depth exploration than abstract eroticism by dragging herself between subjectivity and truth. In My Father Is Over The Ocean, a solo exhibition in memory of her father, Au dismantled items full of personal memories, put them in order with traces of marks and colours on exercise books; Dates moved forward while time traveled backward – in search of the origin when nothing’s lost. The shift from highly compressed emotion to its free expression makes it the most touching solo exhibition in 2013 for me. WONG Wai Yin (graduated 2004) has also been toying on “painting as object” and yet took a “reversed” path. She stepped even further than Au, by firstly performing wonders on items that bear least resemblance to art, and then humorously posing the delicate question: “But is it art?” to viewers. She imitated daily goods and tools with paperboards (which is not only LEE Kit’s favorite material); and reproduced posters at art museums with pale watercolours. She even mocked herself with her introverted personality in her New York solo exhibition “One you might understand. One you might not understand.” The exhibition includes works such as two versions of portfolio (A portfolio out of context, A portfolio people might understand) and a cable with plug at both ends (a clear mock of the so-called “networking” in artistic circle). 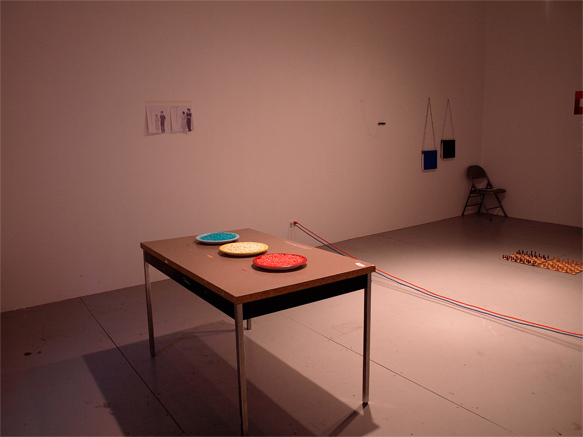 Wong’s work can well be classified as institution critique, but the true value lies in her witty application of material in various media like painting, objects, photography or video recording. 36 x 41 cm/ oil paint/ 2013. Tracing their common path, I asked Wong if there were any noteworthy young artists out there. She suggested Sarah Lai, saying, “Her paintings are good. And she’s a sober brain”. She was the “covergirl” for the “artistic village” feature by City Magazine back in the issue of January 2012. Graduated in 2007, Lai had Lee Kit as her tutor in her university years. Both Lai and Lee built solid foundation in painting in their secondary school years and advanced to a more conceptual development in tertiary ones. For Lai, music is her muse (she loves listening to Noise), and personal feelings became the first consideration when it comes to choice of subject. 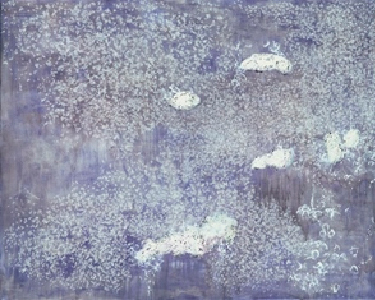 Lai differed from Lee in the sense that she still focused on famed painting in a truly “scientific” process – She would either retrieve her ideal image online, or photographed daily goods before “reproducing” the item of her choice: a cloud, a diving platform without athlete, or a piece of butter, on canvas. Though “real”, these objects were isolated after partial retrieval. The scene even looked cyber with her intentional application of low value in saturating and hue, and subtle twists in the confined tone. 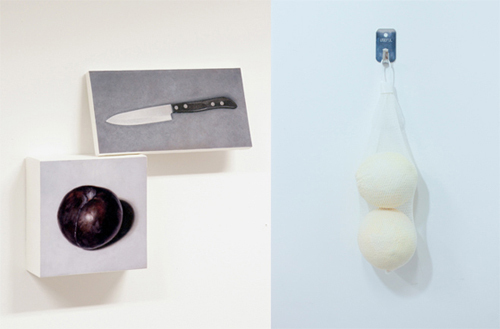 The installation on display in Art Taipei 2013 successfully restored the still object to a 3-D sculpture: A pale-purple peach and a yellowish-white lemon in a real fruit basket, plus an oil-painted sharp knife, all accentuated a sense of drama beyond description. This search for “truth” in media and “re-media”, and a Y-generation reflection, opens a whole new world of presentation from Tsang’s generation. Shall one avoid the identity of “female artist” or embrace it strategically? It looks as if there is no need to bring the topic up again in an artistic circle which feminism raises little interest. As a fresh graduate last year, Wong raised eyebrows by playing the concept of bad girl feminism to the full – printing pictures of her naked self on the exhibition brochure, inviting “uncles” to keep her as call-girl. Her graduation showpiece, however, returned to pictorial plane with sexual and political taboos unveiled. Would this explicit feminine declaration stand out from the pool of “docile paintings”?